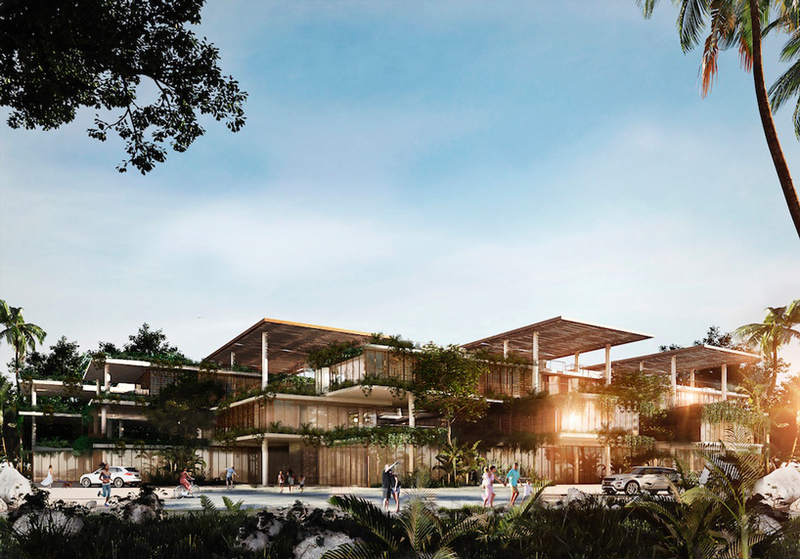 with its design for the amelia tulum residential and commercial project, sordo madaleno arquitectos (SMA) was the only mexican office with a winning project at WAF 2018.
the proposal will become a part of one of the fastest growing urban areas among the coastal jungles of the yucatán peninsula.in its design for the winning WAF 2018 entry, sordo madaleno arquitectos integrates commercial and residential program with a stacked, cross-laminate organization. in its design for the winning WAF 2018 entry, sordo madaleno arquitectos integrates commercial and residential program with a stacked, cross-laminate organization. the structure is divided between three bays on each level. the first three bays along the ground level contain a select commercial program that coexists with the residential development, while the three floors above are interwoven in opposite directions to form a checkerboard in plan, resulting in exposed interstitial spaces. these voids become gardens, terraces, and patios, and are conditioned to produce specific natural atmospheres in which nature seemingly overtakes the architecture. one of major challenges of building in the tropical climate of tulum is reducing solar gain and maximizing air flows to keep the building fresh. 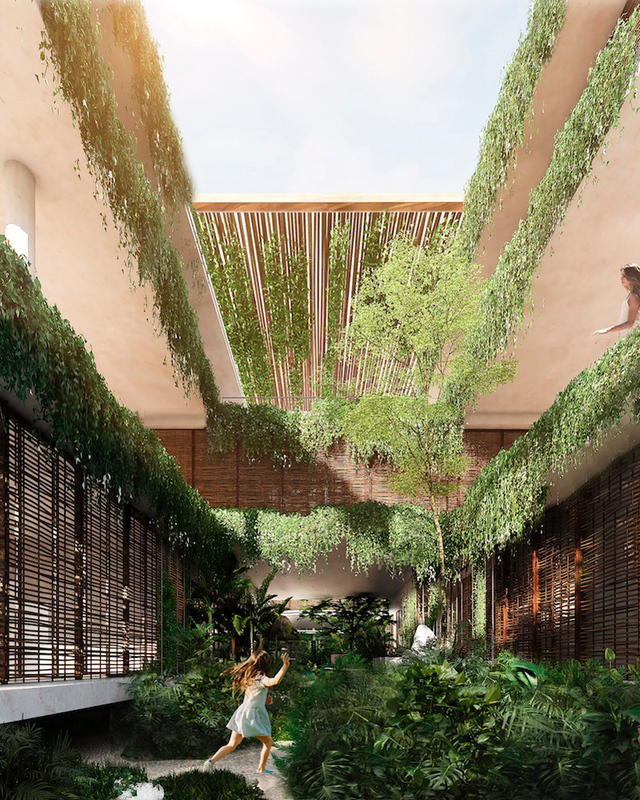 various passive systems, such as eaves with vegetation above the windows, protection with natural woven screens and pergolas — constructed with locally-sourced timber — provide the principal sustainable feature of the complex. the thirty-eight apartments have terraces and bedrooms with private entrances, and share the top floor which offers open-air amenities such as a roof bar, hammocks, pool, sunbeds and grill. the landscape design affords an outstanding role to the native vegetation bordering the perimeter of the building. the dense plantlife penetrates the internal corridors and weaves throughout the ground floor. most of the existing flora will be protected during the course of construction in a temporary nursery before being transplanted to become part of the building. the principal structure is reinforced concrete together with post-tensioned slab systems, while the other materials and finishes make use of local artisan techniques, incorporating the local economy into the construction process.